You can allow or require membership applicants and event registrants to upload files, or you can upload files yourself to their accounts. To allow members and other contacts to upload files, you create a file attachment field. Depending on where you want the field to appear, you can add the file attachment field as a membership field, a common field, or an event field. You can choose whether to make the field mandatory or optional. You can also control member access to the field and set privacy restrictions for the field. File attachments do not count towards your site storage limit. So, even when you reach your storage limit, your members will still be able to add more files to their applications, event registrations, and profiles. To members and contacts to upload files, you need to create a file attachment field. Depending on where you want the field to appear, you should create it as a membership field, a common field, or an event field. On the screen that appears when you click the appropriate option above, follow these steps to add the file attachment field. If you want this field to mandatory, check the Required field checkbox. If you are adding a common field and want it to be internal field – so that only administrators can upload and view files using it – check the For administrator use only checkbox. For membership fields, select the appropriate options under Member access. 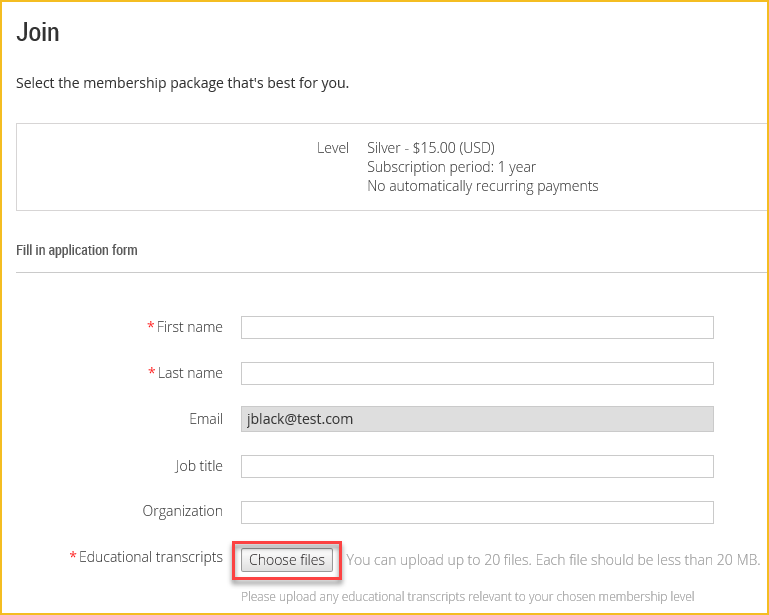 These options determine whether members can add files within their member profiles and/or within membership applications, only view them, or not see them at all. For membership fields and common fields, you can control whether other members or public visitors can view the contents of this field by choosing the appropriate option under Others access. Your choice can be overridden by each member from their Member privacy settings (unless you lock the field from being changed). Setting this to No access will not stop members from editing their own values for this field, and will not stop the field from appearing in the membership application form. For membership fields, choose which membership levels to which the field applies in by clicking the appropriate option under Use in. Membership fields will be automatically added to membership application forms for the membership levels you specified. Common fields will be automatically added to all forms, though you can choose to remove them from event registration forms for individual events. Event fields will appear on the event registration forms for the events you added them to. When you create a membership field, you can control whether members are allowed to view and/or upload files using this field. Members can upload files (and remove uploaded files) by logging into their accounts and editing their member profiles. If this option is disabled, members will be able to view their files within their member profiles, but not remove them or add to them. 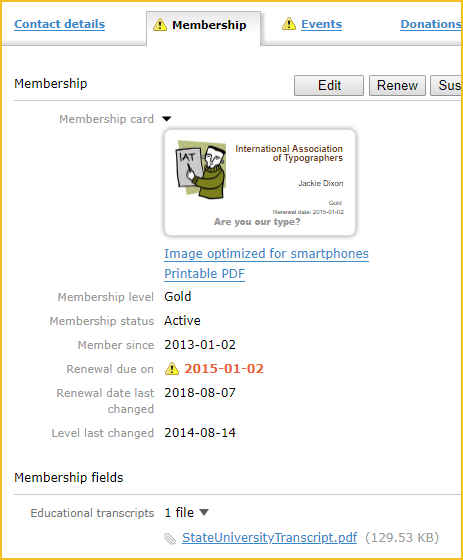 Members can upload files when filling in the membership application form. Members can view the files uploaded to their account within their member profiles but only an administrator can upload or remove the files. Only administrators can upload files using this field, and only they can view and remove the uploaded files. When you create a membership field or common field, you can control whether other members or public visitors can view the contents of this field. The choice you make under Others access is used as the default privacy setting that appears for that field on the Member privacy settings screen and on the Privacy tab of individual contact records and private member profiles. These settings determine whether the file attachments can be viewed in member directories and on their public member profiles. From the Privacy tab on their member profiles, members (and logged in contacts) can change the default privacy settings for individual fields, unless you have locked them down on the Member privacy settings screen. From the Member privacy settings screen, you can change the default privacy settings for individual fields and optionally, force those changes onto individual contact records. Make sure you review the privacy settings for file attachment fields, particularly if you are creating it as a membership field, since those settings will determine whether potentially sensitive or private documents are visible within public member profiles. On forms, the file attachment field will appear as a Choose files button that can be clicked to upload up to 20 files, with each file a maximum of 20 MB. If you designate your file attachment field as a required field, then those filling out the form will have to upload at least one file before submitting it. After a file has been uploaded to a contact record, administrators can view or download the file. Except for files uploaded using an event field, administrators can also remove the file or upload additional files. Files uploaded using common fields can be managed from the Contact details tab within the contact's record. Files uploaded using membership fields can be managed from the Contact details tab or the Membership tab. To remove an uploaded file, or upload an additional one, click the Edit button then click the red X icon to remove a file, or the Choose files button add a file. 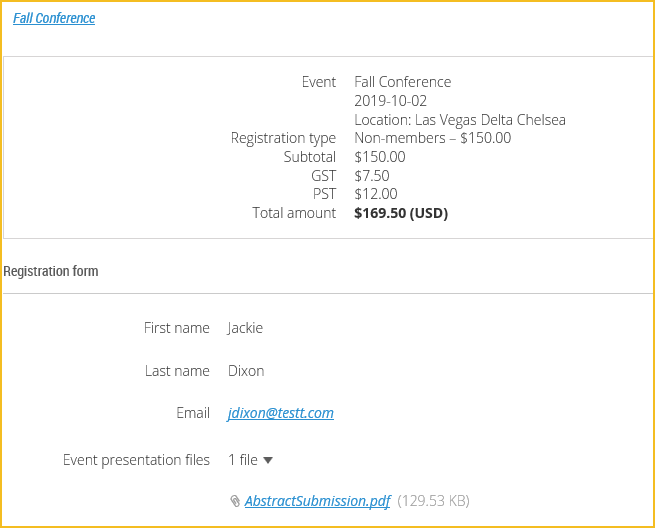 Files uploaded using event fields can be managed from the registrant's registration details. Administrators can edit the registration details and add files or remove files from the registration. Depending on your settings, members (and logged in contacts) may be able to view, remove, and add to the files associated with their account from their private member profiles. 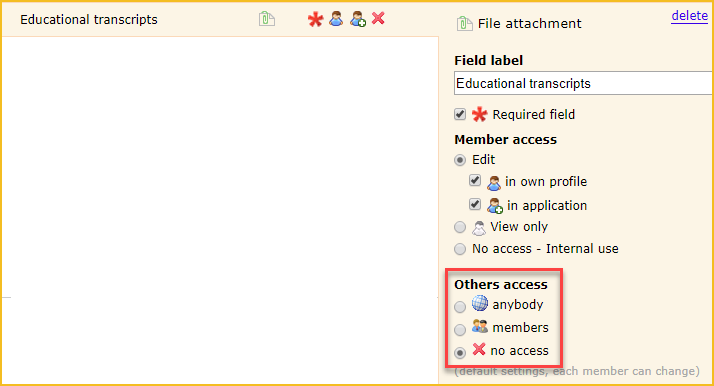 If you chose No access under Member access for a file attachment created as a membership field, then the files associated with this field will not be visible to the member or contact. Similarly, if you chose For administrator access only for a file attachment created as a common field, then the files will not be visible to the member or contact. Unless you designated the file attachment field as an admin only/internal use field, then members (and logged in contacts) can view them from their private member profiles. Common fields and membership fields can be viewed on their Profile tab. 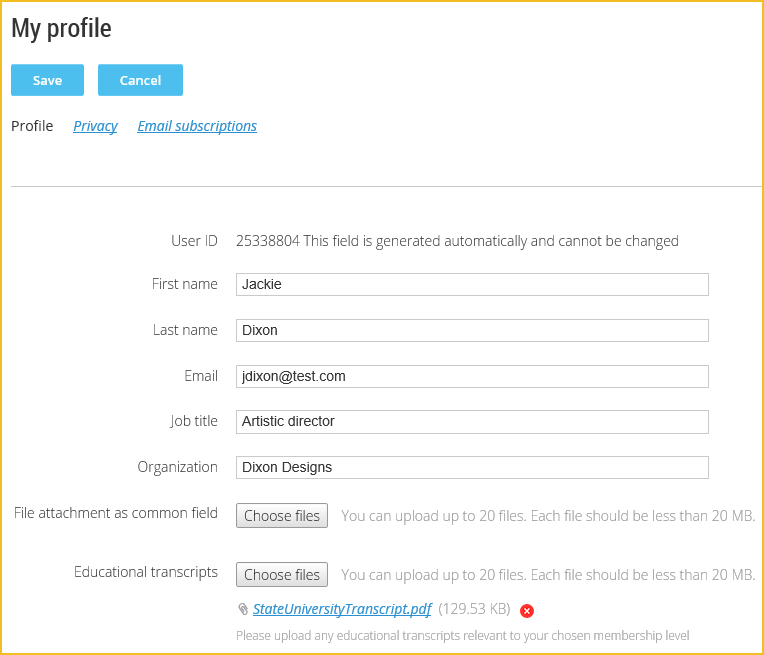 For file attachment fields created as common fields, members (and logged in contacts), members can also remove uploaded files and upload additional ones. To do so, they need to click the Edit profile button from the Profile tab within their private member profile. For file attachment fields created as membership fields, members and contacts can only remove uploaded files and upload additional ones if the Edit in own profile option was enabled under Member access. For file attachment fields created as event fields, registrants can view their attachments by clicking their event registration within the list on the My event registrations tab of their private member profiles. Registrants cannot replace or delete file attachments after submitting the registration form. You cannot import file attachments in bulk using a spreadsheet. When you export contacts or event registrants, the column for the file attachment field will display the filenames of any uploaded files. Multiple files will be separated by a comma.